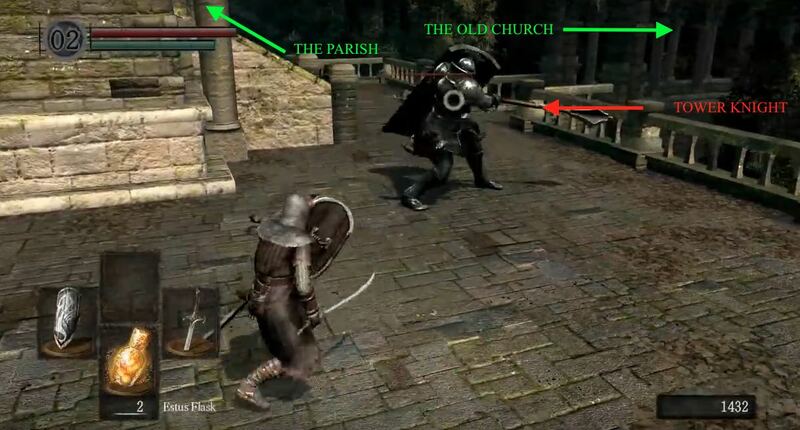 The Undead Parish is a location in Dark Souls and Dark Souls Remastered. Here you will find the first Bell of Awakening. 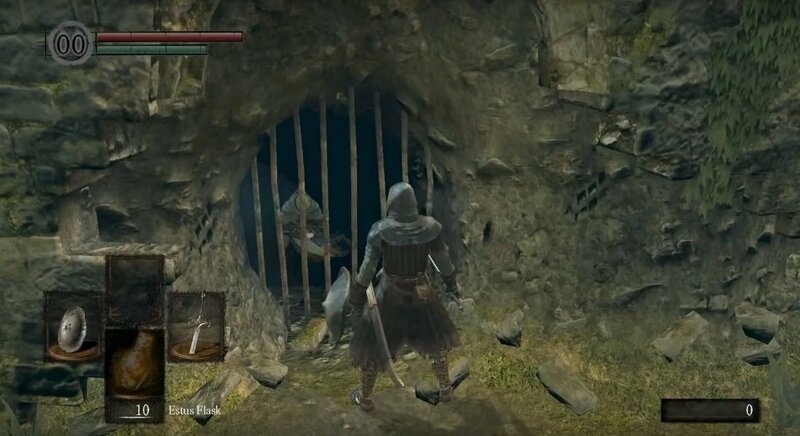 This area can be reached via Undead Burg initially or via Firelink Shrine (once you unlock the elevator) and it's also the gateway to Darkroot Garden and Sen's Fortress. Welcome To The Undead Parish - Whether you've entered this area via the ladder that came from the Upper Undead Burg or through the portcullis that you may have opened behind the Wyvern, both entrances are very close to each other - taking the passage to the right from the portcullis you'll find the ladder. At the ladder entrance there is a spiral staircase leading up a tower on your left. If you follow it up you'll find a Black Knight at the top, however a toe-to-toe fight right now would be ill-advised and revisiting it in the near future would be better suited. Turn right as you exit the doorway to see an Undead Solider waiting on top of some stairs. Past this first undead, a courtyard containing a new monster in the distance - the Fang Boar - among some other, more regular, Undead Soliders. You will note two Archer Hollows on a ledge behind the boar, as well as two Undead Soliders on each side of the beast. There is another Undead Solider (Spear) and some stairs on your right. At the far back, there's also another undead solider under the ledge with the archers on it. You will be able to lure the one enemy next to the Boar as well as the spear soldier on your right. Triggering the solider on the left will cause him to run back and pull a lever to drop the portcullis at the end of the courtyard, behind the boar. Once you have killed all immediate threats, make your way to the archers by heading up the stairs on your right and taking care of the undead as you go along (Note: Once you get upstairs you will have to deal with a spear wielding Undead Solider and two archers. Taking out the archers first may make the battle easier). The remaining soldier, behind the boar, will likely come chasing after you while you're up here, so there's no need to go downstairs to get him. You will find Alluring Skull, an item you can use to bait the Fang Boar, on the ledge past the archers. Pork Roast - With all the undead dealt with, now it's just you and the Fang Boar. You should be able to dispose of it while you are upstairs by using spells, arrows or dropping some firebombs on it, and may drop the Fang Boar Helm once defeated, if you're lucky. For a straight fight with it, try to stay to it's sides with your shield up to avoid getting hit and attack when it's not attacking. If you go to it's rear end you'll be able to perform a backstab also, but beware that it has a rear kick that's quite painful if you don't successfully perform the backstab in time. Alternatively, if you happen to be fast enough to follow the enemy that closes the portcullis, and if the boar is under it as it closes it'll kill the boar instantly. You don't actually even need to touch the boar, you can bait it into charging through the two burning stacked corpses found in the area, and it'll take considerable damage for the long period of time it's stunned after the charge while standing in the fire. The Black Knight Returns - Once the courtyard is cleared, now is the time to take on the Black Knight that we ignored earlier. Go back to where you left him and confront him - and by confront him, we mean lead him to his own demise. Once he's following you, lead him back down to the courtyard and toward one of the fires present here - the one further away is recommended. Ensure the fire stays between you and the Black Knight and he will continuously burn himself while trying to attack you. Keep this strategy up and before long he'll die and drop a Titanite Chunk without even taking a single swing at him. Easy money. Hollow-Round Me Are Familiar Faces - Go to the end of the courtyard and descend the stairs on the right. Here you will see a Hollow starting to run away from you, leading you into an ambush - so beware. The first room will have two more Hollows, one on either side. Lure them out to deal with them. Up the stairs there are 3 more waiting to ambush you. The Hallow that ran from before will jump-attack you from the left, so be careful. In total two Hollows on the left plus the one on the right. Once up the stairs, you will see a small area at the back, as well as another hostile Hallow. Kill it and find the Mystery Key on the corpse on the other side of the table. Heading back up the few steps to find a ladder on your left. Climb it to find two more Hollows to fight. Next to the ladder you will note a body hanging on a beam. You can carefully walk over the beams to find a Large Soul of a Lost Undead. Climb the second ladder where you'll find a room with a fog gate to your right. Enter the fog gate and you'll find yourself on a walkway above the initial courtyard that you fought through earlier. At A Crossroads - Cross the walkway and you will reach a T-junction. Going right you will see the back of an Undead Knight. You have the advantage on this one to sneak up and backstab him, but be warned; he is able to counter your strikes, so jump attacks are very useful. Past him you will find a Knight Shield. Going left, you will find some more stairs and an Undead Solider (Spear), on your left. Head straight through the passage until you come across another T-junction, but don't venture out of the passage. On your right is another Undead Solider (Spear) and on your left, an Undead Knight (this one will be facing you, so use extreme caution). You can try to lure the Undead Solider but it is very hard to do so without aggravating the knight on the other side; I recommend to run to the left and try to behind so the Undead Knight is in between yourself and the Undead Solider, this is because the solider is much more defensive than the knight and will buy the knight enough time to box you in and kill you. The narrow corridor makes for a tricky fight but firebombs also work great as a counter attack. Head down the corridor and make a note of the passage on the left - we will come back here soon. 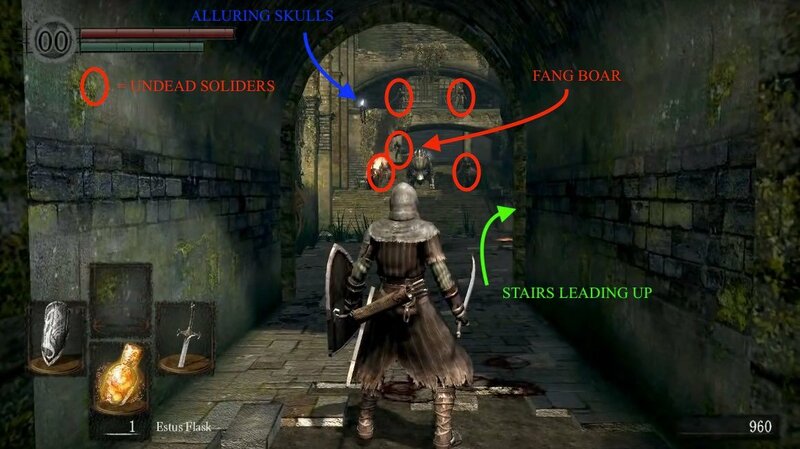 Go straight forward and down the stairs where you will find two Undead Soliders and an Undead Archer. After killing them, you should notice a doorway to the left and a passage on the right. The doorway is a side entrance to the parish but we head right for now, we'll come back to it later. Reinforcements - At the end of this passage you'll enter an old church and down the stairs here you will find a bonfire (which is worth kindling as you will use this one a lot throughout the game) and a doorway leading to the currently locked gates of Sen's Fortress, they lead you to Siegmeyer of Catarina - a jolly soul wearing rather cumbersome looking onion-shaped armour. He's waiting patiently for the gates to open and you'll meet him again inside Sen's Fortress once the gates are unlocked. 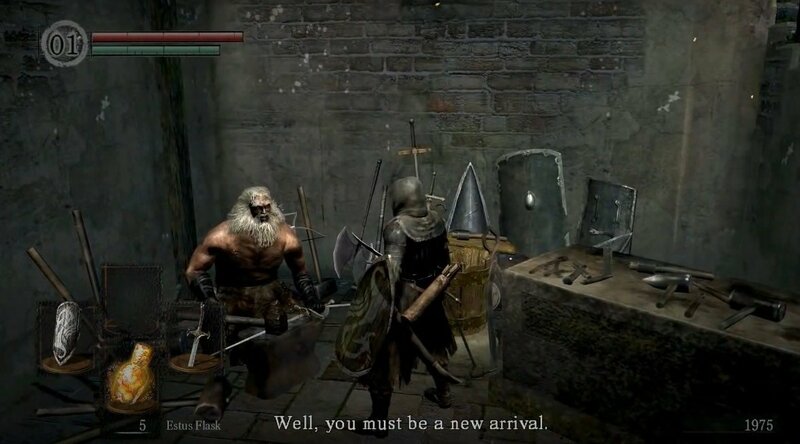 Head down the stairs at the bonfire to meet Blacksmith Andre of Astora (He can upgrade weaponry on the standard, raw, divine and occult paths, once you obtain the correct prerequisites) and another doorway, guarded by a Titanite Demon, leading down to Darkroot Garden. This Is Later - Trackback to the second T-section from earlier, and take a left instead to access the front entrance of the parish. Inside the doorway of the church, on your right, you can see two Undead Knights. As soon as you approach the door one of them will start coming for you, so give the doorway a wide-berth if you want to avoid a fight for the moment. Beware of a third Knight lurking behind the door on the left. Right at the back near the alter you'll see the Tower Knight. 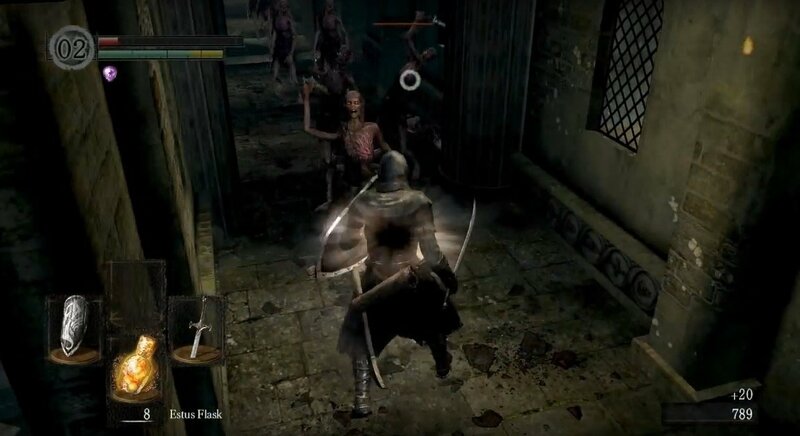 Try lure them one at a time and remember to collect the Halberd and Basement Key (to allow access to Lower Undead Burg) from the two corpses outside, don't forget to deal with the Undead Solider that locked you out to begin with and make him pay! Pulling the lever will open the portcullis back to the courtyard at the beginning of the area. Note: If you reset with a bonfire and access via the original route, the pesky Undead Solider will trigger the lever again, resetting the shortcut. The Big Knight - Time to kill the Tower Knight. Instead of heading into the parish from the front entrance, it is much safer to use the side entrance along the path that leads to Andre. Once you go in, the Tower Knight will be standing next to the altar on your right. Consider luring him out the side entrance to give yourself some room for the fight - his attacks hit pretty hard but are slow and he shouldn't prove too difficult if you have room to manoeuvre. He drops a Titanite Shard once defeated and doesn't respawn. It's A Small World - On the altar you will find a Fire Keeper Soul - DO NOT use it and keep it for your impending return to Firelink Shrine. Turn around now so your back's to the alter and look up and you'll notice a new enemy up on a balcony - a Channeler. He shouldn't notice you from down here but once he does he'll fire soul arrows at you, and is able to buff the enemies around him. Making it a good idea to take him out now rather than later. So if you have a bow you should attempt to do so from here - a head shot will stagger him and not allow him to fire off a soul arrow and a few consecutive hits will take him out. Once he's dead he won't respawn. Now, facing the same way head right to find two elevators and a flight of stairs leading upwards on the right. Permanently open a new shortcut to Firelink Shrine by activating the lift. 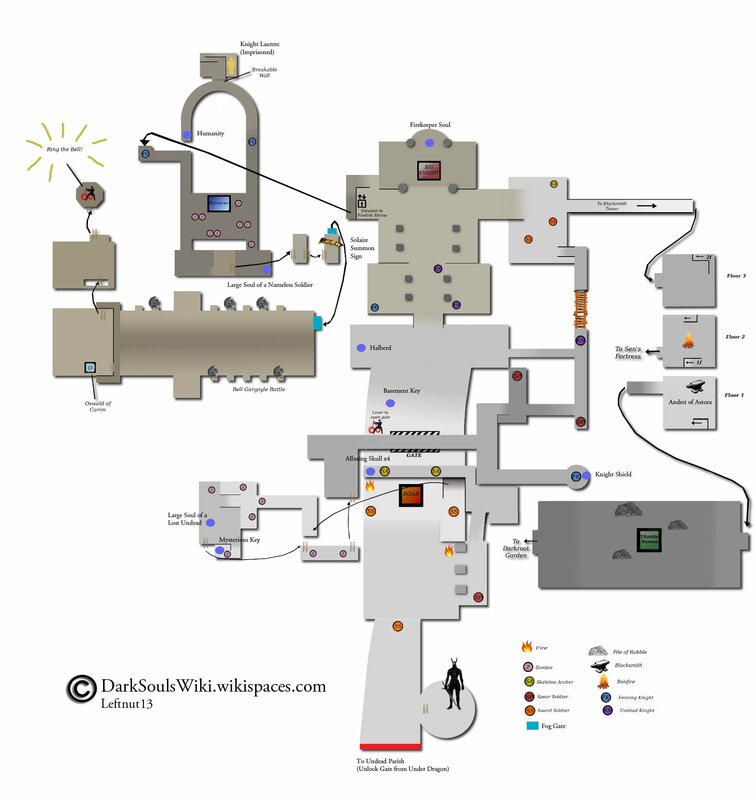 (NOTE: This is also the elevator you will use to gain access to the Northern Undead Asylum again.) While in Firelink Shrine, take this opportunity to upgrade your Estus Flask. Go down the discreetly placed stairs to the left of the Crestfallen Warrior, talk to Anastacia of Astora (the woman behind the bars) and use your newly acquired Fire Keeper Soul to reinforce your Estus Flask - this will refill more HP when you use it. Head back up to the Undead Parish the same way you came in. The Horde - After ascending the elevator again, turn left and go up the stairs where you'll meet another around the corner. Follow the passage until you see a big room ahead. DO NOT enter this room - there is a horde of Hollows that will come chasing after you (and if you didn't take out the Channeler earlier on then he can make them more powerful, so caution is advised). Lure the zombies into the corridor to limit the horde's effectiveness and provide a steady and manageable stream of zombies to take on (once they're all disposed of, go into the room and kill the Channeler if you have not already done so). Freedom - Once inside the room, there are passages ahead of you on the right and left of the room and there's also one on the left behind you. Take the one on the left in front of you t to find a small room with a Large Soul of a Nameless Soldier on a corpse. Heading out the same way you entered and straight through the doorway into a corridor with stairs at the end of it, you'll come across an Undead Solider at the top of the resulting stairs. Get him out of the way and head up the stairs, following the passage to the end where you will find a corpse in a barrel, break it to reveal its Humanity. Head back and you will see light passing through some wooden boards on your left. Break through, climb the stairs to find Knight Lautrec of Carim locked in a cell. 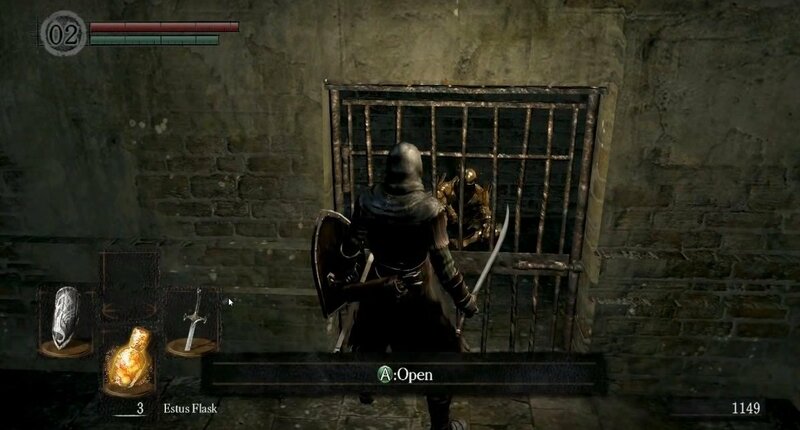 The Mystery Key you picked up earlier can help you free him, if you wish; choosing to do will allow you to find him at Firelink Shrine, sitting down near Anastacia's cell and if you talk to him you'll then be able to use his services for the Parish boss fight (see Lautrec's page for more details). Finally head back to the room of the horde and take the unexplored passage on the right. Head up the ladders to find the fog gate, that leads to the Big Boss. Note: Before you go through the fog gate to face the boss, it should be noted that if you're in human form you have the opportunity to summon some help. If you met Solaire in Undead Burg and if you also freed Lautrec and then talked to him back in Firelink Shrine you will find their summon signs on the ground nearby the fog gate, so look around. 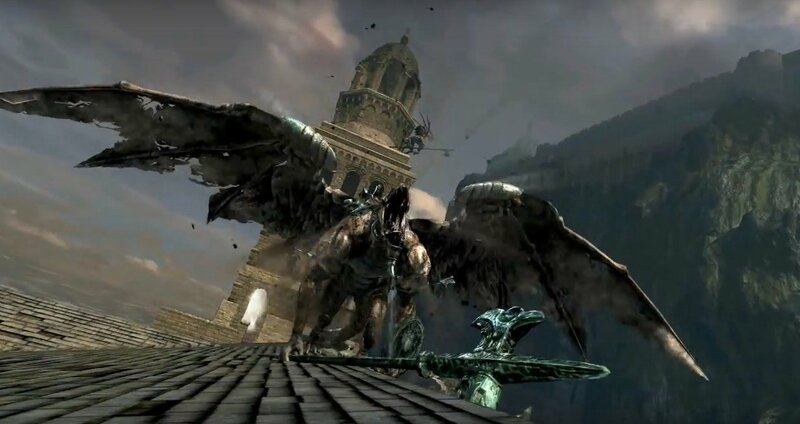 Quasimodo - Once the boss fight is complete, climb to the top of the tower head to ring the first Bell of Awakening and receive six Homeward Bones, but resist the urge to use one. 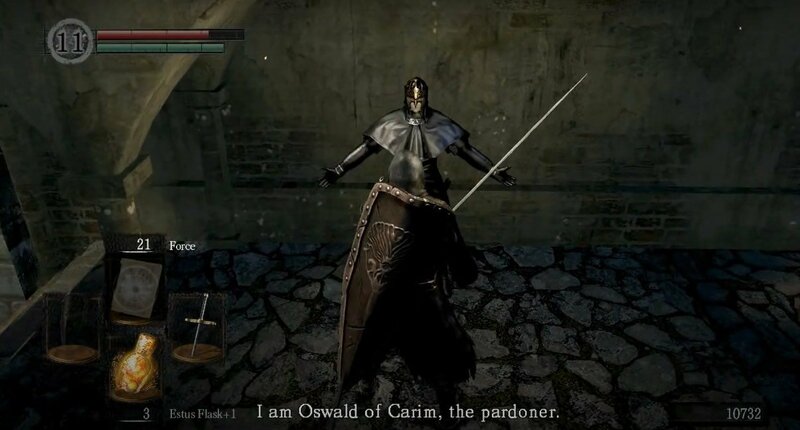 Instead head back down again to meet Oswald of Carim. It's advised that you buy some Purging Stones from him before you leave if possible - the last thing you want is to have to trek back here to buy them when you need them. The next destination is Lower Undead Burg, which you can access through the locked door at the other end of the Wyvern bridge. Do you need to free Lautrec to summon Solaire? I found a strange red-bug thing in the curch after ringing the bell and beating the hydra...anyone know what it is?